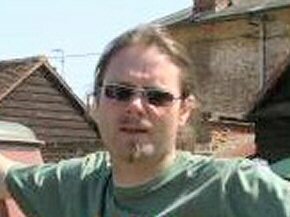 Alex Thomas, Chris Fisher, Joanne Hill and Russell Grinham have entered two teams in the 2007 Plymouth-Banjul Challenge, under the group name Ice Cold 2007. Team Ice Cold in Bakalarr, (T7316) Joanne and Alex, will be supporting Pageant. They intend to help Pageant by providing woodwork and metalwork facilities at Bakalarr Basic Cycle School, and also improving the multi-purpose sports court. Team Ice Cold in Banjul, (T7315) Chris and Russell, supported Health The Gambia, helping to provide Neo-natal Facilities at the Royal Victoria Teaching Hospital. 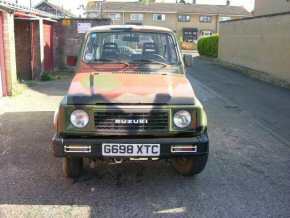 They had two vehicles, a 1989 Suzuki Samurai jeep and a Ford Transit ambulance. 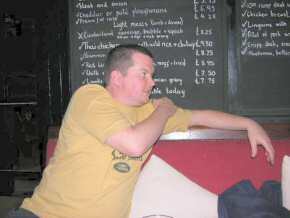 Both teams will be in Group 3, leaving on 29 December 2006. On this page we bring you news on the preparations, fund-raising and performance of both teams. The most important thing is that we have begun our fund-raising. Steve Barlow, a colleague, started the ball rolling with a sale of plants raising £51. Whilst Steve was busy growing and selling his plants we have been agreeing the team logo and developing the flyer. These have been developed with the help of our backroom team, Phil the web wizard and Martin the graphics guru. Last Saturday we took XTCold along to the Milton Fete. Milton Fete is a traditional celebration of village life complete with Morris Dancers and Pony rides. 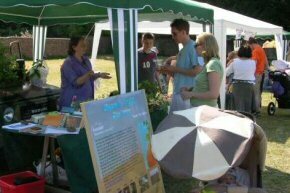 On our stall we had more plants to sell and a lollipop lucky dip, which the kids loved. The stall was managed by the rest of the back room team, Debbie and Tristan. By the end of the day we had raised a further £72 and many promises of help. So what next? Well we are hopeful of doing more fetes and two different bands have offered to play charity gigs. There is of course the pledges which have started to come in. And we are hopefully of raising some corporate sponsorship. So with another £9,877 still to go I guess we had better start writing. Saturday saw Alex 'power skate boarding' until he fell off (one skateboard, 2.5 litres of diesel power). So battered and bruised we took him for a full English breakfast at the lively seaside resort of Sidmouth. Sidmouth is for the young in heart. Where other towns have cycle lanes, Sidmouth needs them for Zimmer frames. Still we weren't daunted it was off with the shoes and in to the sea for a paddle. By the time we got back to the campsite things were really starting to heat up. Fortunately the weather was getting cooler so it kept us in balance. After a few beers Russ retired to his tent for a snooze, for the rest of the afternoon snatches of row row row could be heard coming from his tent. During the afternoon we made a number of friends from group 3. Then it was on to the evening entertainment, two excellent bands and several beers later we called it a night. Of course we didn't sleep, the rain and the cows saw to that. A new coil and XTCold is like new, well we're getting a spark. 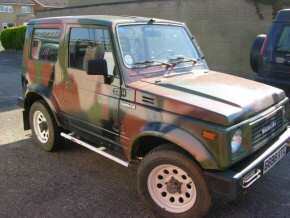 Ice Cold's first vehicle, a 1989 Suzuki Samurai, came in striking camouflage livery. 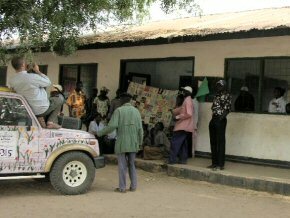 The journey to The Gambia goes through areas where it might be mistaken for a military vehicle, so a competition was held to design a new paint scheme. This competition is now closed, and the name of the winner will be announced soon. The new paint job is a roaring success. Whether this makes it less likely to be shot at is another matter. The Plymouth-Banjul Challenge rules normally insist on vehicles being left hand drive. However, exceptions are made for certain types of vehicle, such as ambulances. Ice Cold took advantage of this, and has bought one. 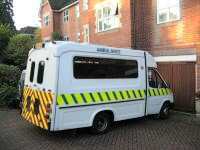 It is a Ford Transit with a 2.8 litre petrol engine. Alex reports: "Ambulance running well and sat on my drive, no serious knocks or rattles and made the journey from Caerphilly without a hitch. In summary: Clutch good, Brakes need bleeding, Handbrake needs adjusting Steering ok, Lights ok but indicator needs fixing, Engine Cooling system ok. Engine sounds fine and ticks over nicely. Excellent twin battery arrangement. No apparent oil / fluid leaks. Good internal lights. Internal heating good. Oxygen system and shaver point. No whines or knocks. Exhaust new. Enough space to have a dinner party. Tyres not great. Interior and exterior good. Clock slow. No radio. Plenty of power but not much ground clearance. No serious apparent rot. Manual ner naa ner naa noise." More details when we have them. See also the vehicles section of the Ice Cold website. Sorry that it is so long since the last update, summer just got in the way! 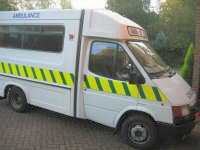 But we haven't forgotten to carry on fundraising and as you will have seen we also have a Welsh awbulance. In July Jo and I went to meet Omar which was great fun, a real learning experience. On the way home Jo casually dropped a bombshell by announcing that she was about to move to Warrington! Not wanting to let an opportunity like this pass we arranged some fund raising events on Jo's final day. 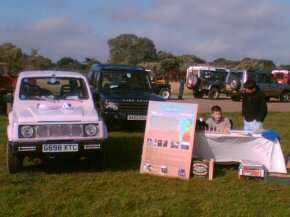 This coincided with Russ's car design competition and so following a large amount of bribery during the day the final design was a pink jeep with flowers down the side..... Thanks have to go to all of Nirex's staff as between them they raised over £300 - WOW. 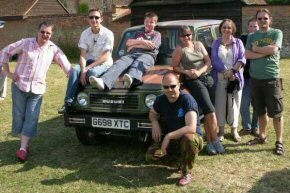 Our next planned outing was to the Abingdon 4x4 Festival on the 23 September. Alex & I decided that we'd use our finely honed painting skills and paint the XTCold pink. Unfortunately they don't sell cheap pink paint, so we made some. It came out very ucky and has gone on with a rather tasteful pebble dashed effect - I can see the orders rolling in now as we set a new trend across the UK- we've even questioned whether we should give up our day jobs. 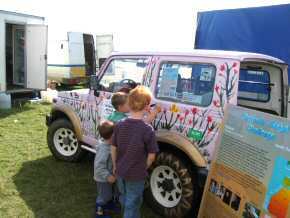 The 4x4 festival was great fun. Several people paid to sign the car. There are a range of different messages and designs, some of them are even publishable. Several of the stall holders made generous donations including the Thames Valley 4x4 Club (http://www.tv4x4.co.uk/) who very generously donate a complete set of off road tyres for the Suzuki and also donated was a set of nets to hold down luggage. At the end of the event XTCold was looking cool and ready to go, well as cool as pink jeep with flowers can! 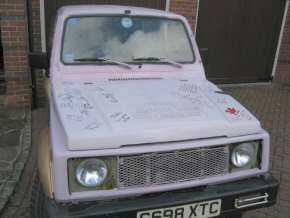 The Awbulance now has an MOT and I am suggesting to Alex that it might look good in pink, I think we have got some paint left.... Our next event is at the end of October, when Nirex are hosting a joint fund raising day for Breast Cancer Awareness, Pageant and Health the Gambia. Tristan is also trying to arrange for us to go to one of his school assemblies to talk to the kids - how scary is that? On Monday 11 December I was invited to take XTCold to Ringwood School as part of the fundraising efforts for Pageant. this was the longest run that I had done in XTCold, she went beautifully. I even got her up to 70mph on one windy down hill section - flying! Curiously she has an alarm when you reach this speed, I can't imaging why as she is shaking and whining so much there is absolutely no doubt that you are approaching 70mph. When I eventually found the school, my map reading has still not improved - it is going to be down to Russell to make sure that we get to the Gambia. 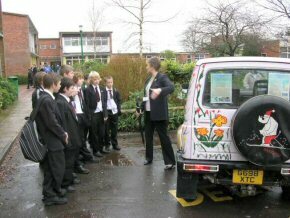 All the pupils were very impressed and the car is now covered in graffiti - she really looks the part. There are further pictures from Ringwood on this news page. Pageant is indebted to the IceCold webmaster, Phil Purnell, who transformed communications from the team into postings on the IceCold blog, and allowed us to steal them. Initially blog postings were copied verbatim, and we then edited them down a bit after the moment had passed. 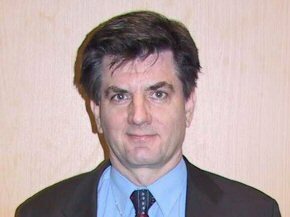 There is a link after each update to the original blog posting, which will allow you to read Phil's timeless prose in its unabridged form. A quick Happy New Year from the team. First task on the Dark Continent: to source a universal joint for the ambulance somewhere in Tangiers or thereabouts. Such is the glamour of international exploration. At a town called Khenifra, [map] about 350 km (about 220 miles) from Marrakech, the ambulance was having drive-train problems, probably as a result of the failing UJ. Local mechanics were confident that they could effect repairs. Also despite the delays quite a few PBC teams were behind them, so there was now urgency to reach Marrakech on schedule. As an adjunct to the customs saga, it turns out that the ambulance is now adorned with an official Moroccan Royal Seal keeping the doors shut, which has become an object of some admiration among the other PBC teams. IceCold caught up with some of the other teams and formed a convoy of four vehicles on the dusty trail to Nouadhibou, with a few hours from there to the Western Sahara/Mauritania border. After a very nice Chinese meal, it was finally off into the desert. Thanks were due to Freya and Co, met at the Sahara Regency Hotel in Dakhla [map], who organised mechanics for five poorly vehicles in the convoy, found the restaurant etc. The guide for the convoy was called David (Arabic Da'ud or Dawud). *The Tempest a5 s1 1.33. A convoy of seven vehicles entered the desert; the IceCold pair, a Renault R19(Camel Tow), a Peugeot 405 (Def.Intrepid), a Beetle (Getcha Motor Running) a Fiat Uno (Engineered to Destruction) and a Fiat Croma (2Porsche2Push), ably guided by local lad Dahia. They were already experiencing unfamiliar conditions - rain, wind and cloud cover are not normal - and things proceeded to get steadily worse, with the wind whipping up the dunes into a sandstorm. With visibility severely reduced and airborne sand getting into the works, the first casualty of day one was the 405. Repairs being out of the question, the 405 was abandoned and its occupants distributed amongst the remaining vehicles. The campsite was reached that evening. A Bedouin style tent was erected, which fell over in the night, forcing everyone to move into the vehicles. The next day (Friday 12 January) dawned with no abatement of the sandstorm in evidence and the combination of gruelling roads and windblown abrasive tolled the death knell for another vehicle; the Croma. 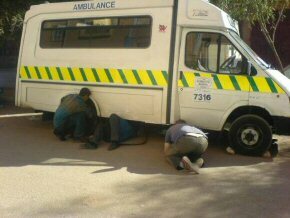 Again, repairs, however valiantly attempted, were futile and the occupants were redistributed: suddenly, the value of having a large van in one's convoy, even if dressed as an ambulance, became evident to many of the participants. Nightfall saw a beach camp established. It was decided that the whole convoy should leave for Zebrabar [map] campsite early on Sunday morning. 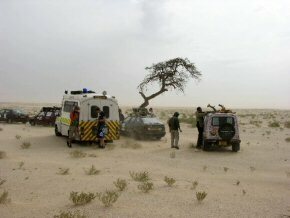 They anticipated that the Mauritania exit/Senegal entry border crossing would be the worst of them all. After a difficult journey, serious border problems were confirmed, and it was 11 at night before all of the vehicles were through the border area. It was then about 55km to the campsite. I have now been home a few days and am starting to get my life back into some sort of order. 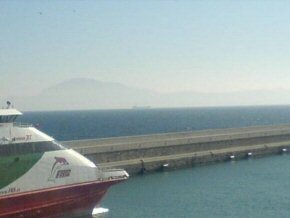 As you will have seen from the website the trip was not without its difficulties but overall a great and enjoyable experience - I would do it all again tomorrow. Alex and I managed to get all of the supplies that we were given to Bakalarr school except for the notice boards - unfortunately these were left with the medical equipment by mistake. 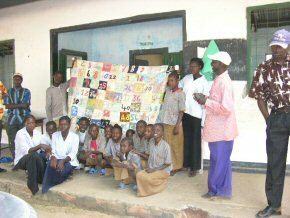 Even so the school were absolutely delighted with everything that we took. With all the excitement of the boarder crossing we forgot to ring Bakalarr and let them know that we were coming so they were not ready for us when we arrived. That said they gave us a very warm welcome and later the headmaster came said thank you again - I found it all very uplifting. The ambulance was handed over to the clinic in Fagikunda. It will be the only ambulance serving a catchment area of 67,000 people. Prayers were said, and the chief and other village dignitaries were on hand to thank our delivery crew and pose for pictures. The clinic seemed mightily impressed with the ambulance, and the Sister who runs the place is organising volunteer drivers. The team went straight from the handover ceremony to the airport, where they caught to plane to Gatwick. 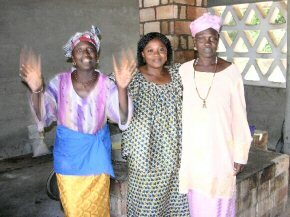 In all the Ice Cold teams raised around £9000 in sponsorship, split between Pageant and Health The Gambia. £2125.78 has already gone to Bakalarr School. A further £2677.41 has been received and Pippa will take this to the school during her forthcoming October visit. This brings the total raised for Pageant to £4803.19. As noted above, the ambulance was donated direct to a clinic. 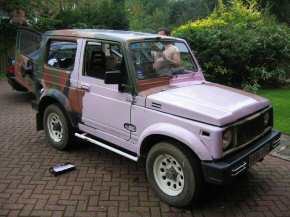 The Suzuki Samurai Jeep sold for 76,000 Dalasis (about £1,363) in a charity auction at the Safari Garden Hotel. Clearly the pink livery had an effect on someone. This takes the grand total raised well over the £10k target. The links below give access to Team Pages on the Plymouth-Banjul website, any Field Reports they might send back by text message during their journey and their own websites. If you are using the Plymouth-Banjul website, be aware that there is another team called 'Ice Cold in Banjul' (T7341). 'Our' team is T7315. The IceCold website progress section shows a list of waypoints on the route, with links to Google maps and other information about the places. You can also see lots of pictures taken during the 2006 Challenge on our Shap Ahoy pages.